This week's Peachy Keen Let's Face it Friday's challenge was to create a project featuring a banner. This can be a full size banner or a card/scrapbook/altered item that features a mini banner strung across it. 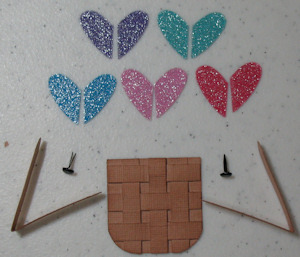 Check out the other great projects at the challenge site HERE and play along for a chance to win the Cottage Cutz Faceless Bug Die set. My project suprisingly does not feature punch art this time! 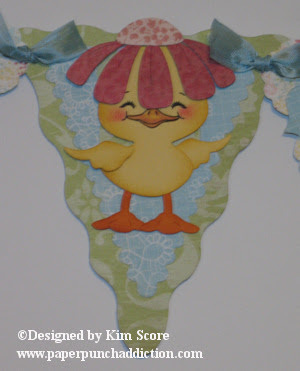 I recently received the Cottage Cutz Duck and Egg and the Accesories dies to go along with it and just HAD to show it off. I also paired it with my Fun Flowers Bigz die from Stampin' Up! Congratulations to the two ladies that won an INKspirations 4U Summer Edition subscription! Following are the winners with their comments. If this is you, please contact me right away at needmorestamps@yahoo.com so I can set up your membership. Good Monday morning everyone. With the holiday this weekend, it appears that quite a few less people were sharing. As a consequence, I didn't have much to share this morning. I plan on compiling some ideas for later this day. 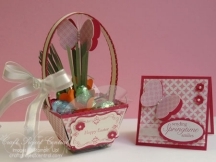 I'm hoping to find more mother's day ideas as I'm ready to move on from the Easter ideas. 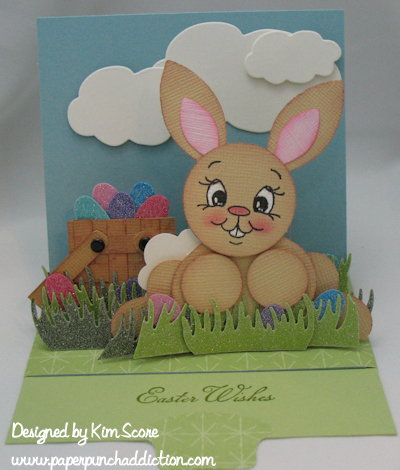 Just wanted to drop in and say Happy Easter everyone! Sorry I didn't get time to post any inspiration today but I figured many of you would probably be spending the day with family and friends and not surfing the net anyway. I will be back on Monday with more inspiration! Hi everyone, before I get to the inspirations of the day, I wanted to remind you of 2 opportunities for blog candy. 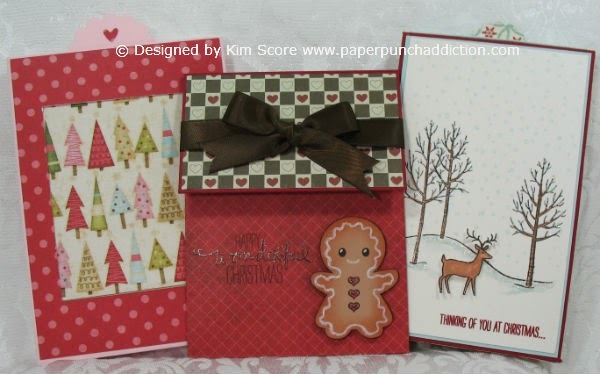 One is for a Peachy Keen stamp set HERE and the other is for a free subscription to the upcoming Summer Edition of the INKspirations 4U online stamping tutorials HERE. Please take a moment to check it out. For one, all you have to do is leave a comment on that blog post. Thanks! Good morning everyone! 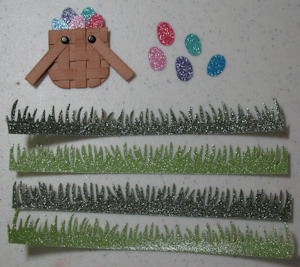 Congratulations to the winner of my Spring Fling punch art class! 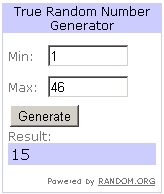 The random.org selection was #15! EDIT: please note, I originally posted that this drawing was for the PKS stamp set. Correction, this drawing was for the digital copy of my Spring Fling punch art class. The drawing for the PKS stamp set is on my Pentagon Treat tube challenge that ends on the 24th. Details are HERE. Our challenge was to create a mothers day card. My mom is a gardening expert and has the most beautiful flower beds. I thought this card was the perfect thing for her. I used the PK-490 Everyday Character Face Assortment and the PK-500 Snow Cuties Face Assortment sets. 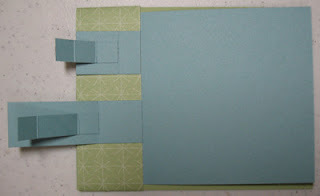 Be sure to check out the other great projects by my fabulous design team sisters at the PKS Challenge Blog HERE. 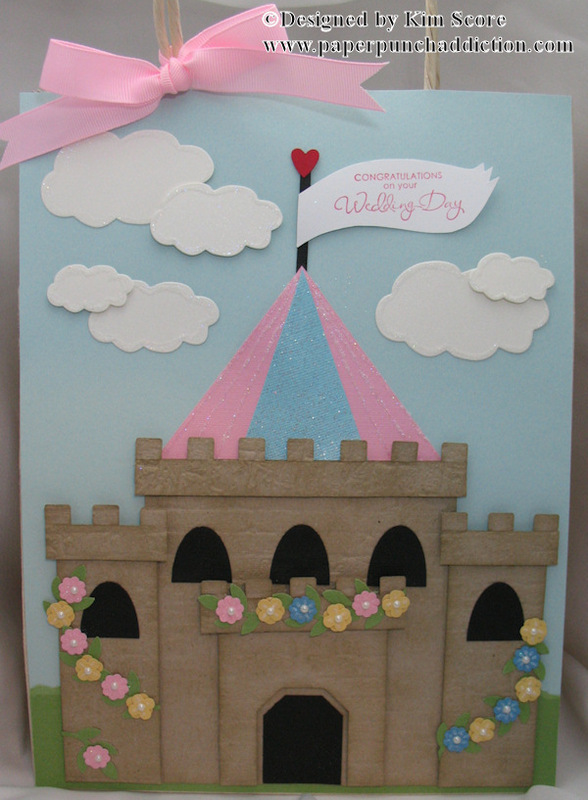 Play along on the challenge for a chance to win the PK-640 Princess Face Assortment stamp set! 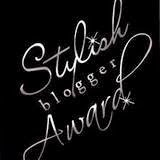 LEAVE A COMMENT FOR BLOG CANDY! As a special treat, I am going to offer some blog candy today. Leave a comment on this post by Sunday at midnight. On Monday, I will do a random.org drawing and the winner will get a digital copy of my Spring Fling punch art class (details HERE). Please make sure that you either have an email on your profile or you leave your email with comment so that I can contact you if you win. Thanks and good luck! Fold the blossom petal in half and sponge the fold to create the vein on the leaf. Sponge edges of leaves with old olive ink. Sponge edges of So Saffron with mustard ink. Stamp faces with black staz on. Add whites to eyes with uniball white gel pen, brush on cheeks with stipple brush and regal rose ink. Punch 3 scallops and clip each scallop towards the center. Layer on top of each other with a dimensional for depth. Attach the face with a dimensional. 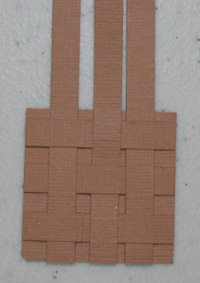 Create 3 leaves and glue together at base. Glue on stem and glue flower head to stem. 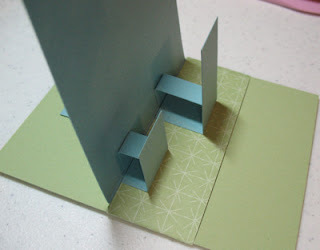 The card base is 7" x 10" Bashful Blue folded in half so that the final card dimension is 5" x 7". 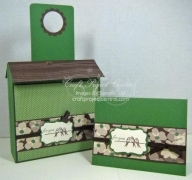 Clouds (shimmery white) and grass (pear pizzazz and wild wasabi) were created using Die-namics by My Favorite Things. Layer clouds using dimensionals. 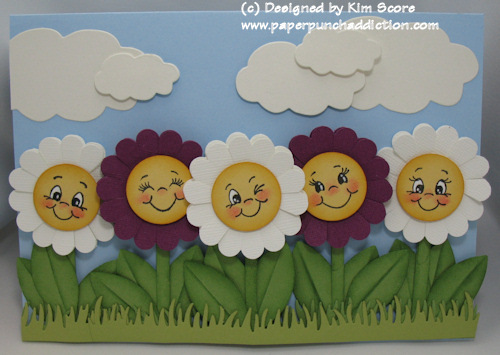 Attach flowers to card with dimensionals. 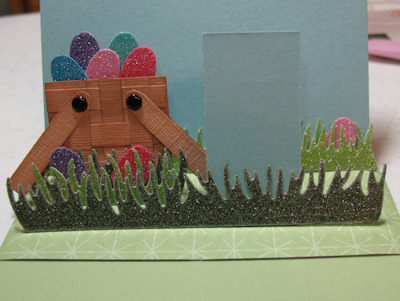 Glue grass at bottom of card over flowers. Please come back at 10 am today for another Peachy Keen challenge. I have another fun punch art creation! Today is the release of the April Edition of Papers & Pixels. I didn't have enough time to write an article for this issue but there are many fantastic tutorials this month. 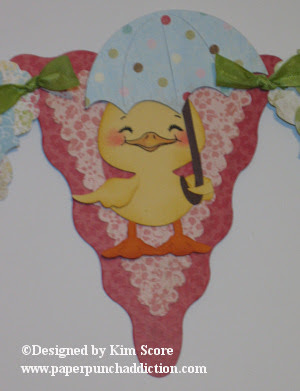 Many paper based projects for Mother's day. You can download the issue for free. Visit the site HERE. 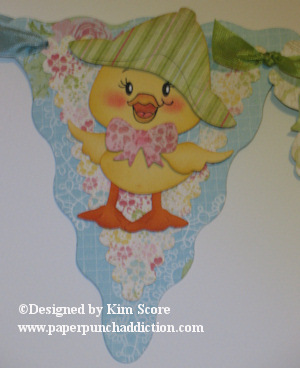 My friend Tracy has a gorgeous paper piecing project and she provides a free download for the pattern at her blog. 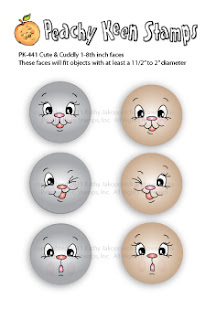 PK-441 Cute & Cuddly 1-1/8"
PK-491 Everyday Character Faces 1-1/8"
PK-451 Wide Eyed Kids 1-1/8"
PK-758 Wide Eyed & Bushy Tailed 1-1/8"
PK-493 Everyday Character Face Parts 3" to 4"
PK-681 Retro Paper Doll Faces 1-1/8"
PK-673 Rag Doll Face 3" to 4"
You may not be able to afford all of them at once, but if you had all of these sets, you would have a very nice and thorough variety of sets that would work with boys, girls, men, women and all sorts of animals plus holiday figures like snowmen, gingerbread, easter bunny, etc. 2) If you want to work with smaller figures that require a head that is 1-1/4" wide or smaller, then you should go with the Assortment sets which have a large variety of stamp sizes in them. Obviously, these sets are more expensive but you get a lot more stamps in the set. If you are considering an Assortment set, my most recommended set is the PK-490 Everyday Character Faces Assortment. I use this set the most and have used the assortment for all of my smaller figures. PK-693 Monster Mash Faces 1-1/8"
PK-691 Make a Monster Faces 1-1/8"
PK-471 Happy New Year 1-1/8"
WHAT ARE YOU WAITING FOR? GET OVER TO PKS AND GET YOUR STAMPS! Hello everyone! I'm excited to tell you about my newest design team opportunity. I will be guest designing for the INKspirations 4U 2011 Summer Edition. You can sign up on the early bird special for $20 if you sign up by April 20th. For details, please visit the site HERE. As a guest designer, I will be giving away 2 free subscriptions to the 2011 Summer Edition. Invitations will be sent out on May 7th for anyone who signs up. And, don't worry about signing up early and taking advantage of the early bird special. If you sign up and win my drawing, your payment will be refunded. You have nothing to lose! For a chance to win, all you need to do is leave a comment on this post. Please tell me what your favorite current Stampin' Up! stamp set is. 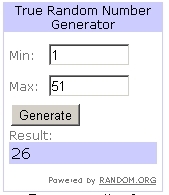 I will be drawing 2 random entries on April 28th. The technique this week on Split Coast Stampers is my pentagon treat tube. The written tutorial is available in the resource section HERE. The cute little bunny attached to the front of the box is a punch art bunny I made for the PKS spring stamp release blog hop. 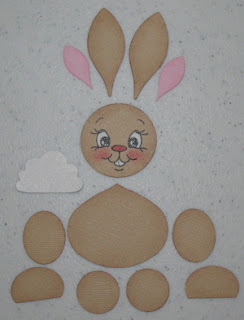 The step by step instructions for the bunny is HERE. Please visit SCS and leave a comment on the tutorial. Thanks! Hi all, I started my Facebook page some time ago. 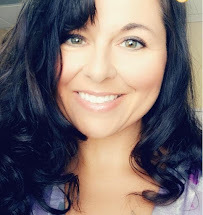 It would be great if you could come on over and "Like Me". Thanks! 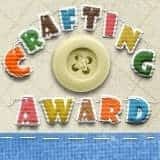 Congratulations to the following winners who won a free subscription to Craft Project Central! Congratulations ladies!! Please email me at needmorestamps@yahoo.com to claim your prize! 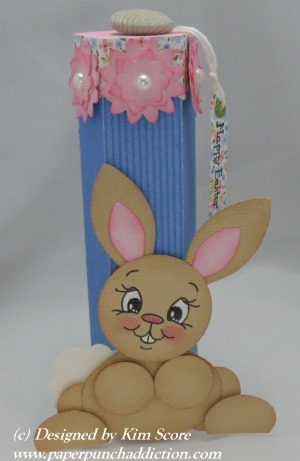 Hey all, Peachy Keen has a great sale on the new spring release stamp sets and cottage cutz dies through 11:59 tonight. Now is the time to get that awesome new Cute & Cuddly stamp set!!!! 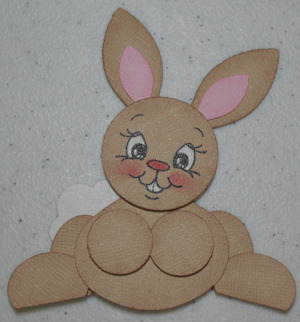 They also have 10% off all other stamps in the store with a $25 purchase through the month of April. If you have been thinking about getting some face stamps, now is a great time to do it! I have had many people ask me what sets I recommend. For punch art, I find that the 1 1/8" or Medium sets work best for me. 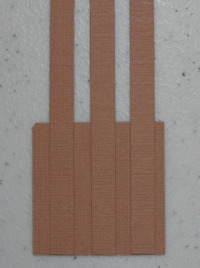 If the head on your figure will be at least 1 3/8" wide, you can use these sizes perfectly. However, if you want a full range of sizes, you should go with the Assortment packages. 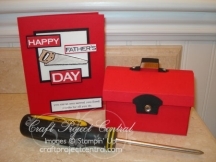 Would you like to win a free subscription to Craft Project Central? I will be drawing for a free subscription to March and April on Monday. For a chance to win the March subscription, please leave a comment HERE. For a chance to win the April subscription, please leave a comment HERE. 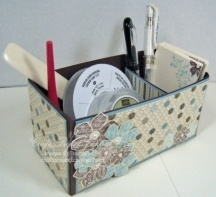 I was asked to continue with my guest designer spot on Craft Project Central. 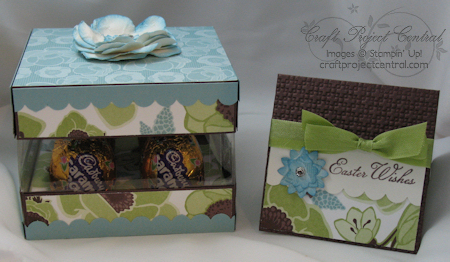 The first project for April is my Cadbury Egg Box. This special box is the perfect easter gift! 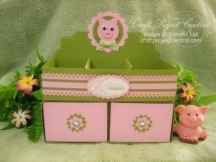 To get the tutorial for this project, please visit Craft Project Central HERE and subscribe to April. There will be 9 other wonderful projects included in your subscription. $10 for 10 awesome projects is a great deal! Leave a comment and on Monday I will draw a random winner for a free April subscription on CPC!